The release of a new Maria V. Snyder is becoming a yearly event, and I’m one of those readers that keeps a close eye on both her “website” and emailed newsletters about any mention of upcoming new releases from her. I still have yet to carve out some much-needed time to read the sequel to her latest series, The Healer series, which focuses around another strong-minded female character by the name of Avry. Blending both the apocalyptic tone of many other YA releases and also familiar elements from Maria V. Snyder’s other fantasy books; you have a winning combination that seems to be bolstered in effect after reading it again. I don’t normally re-read books because I always feel daunted by the possibility that re-reading a book that I really loved the first time might dampen my enthusiasm. Yes, this is probably some delusion of my creation, but psychology aside, it is sometimes hard to find the urge to re-read books you fondly remember for this very reason. Perhaps, this all stems from my experience of watching certain films that I nostalgically remember as being phenomenal, only to be crushed by the sheer mediocrity of the film when watching it again. This happens to comedies too like Hangover,which was insanely funny the first time, but shockingly unfunny the second time. Does Touch of Power fall victim this rule? No. Reading “Touch of Power” the first time made me concentrate too much on their similarities rather than their distinct differences. Yes, they both have their own magic system, but I found that they really have very different motives and even ways of responding to their respective love interests. Is it just me or does Avry seem much more sarcastic than Yelena in her reaction to her love interest in the book: Kerrick? Yelena had her own share of witty retorts, when speaking with the mysterious Valek, but Yelena seemed much more forgiving of some of Valek’s character flaws. In contrast, Avry seems to be far more skeptical about Kerrick’s as a person, and questions the veracity of both his words and motives far more than Yelena did for Valek. Being a skeptical person by nature, I cannot help but love this appreciate this side of Avry. First of all, it is Kerrick who is the one responsible for kidnapping her, whereas Yelena is sentenced to be the poison taster for a ruler,whom Valek happens to be hired as this ruler’s personal protector (I’m working off of memories of reading Poison Study nearly three years ago.. Please bear with me!) Some people prefer Yelena and Valek’s romance, but I am starting to find the romance between Kerrick and Avry to be both more believable and well-developed. Avry seems much more reluctant to express her romantic feelings with Kerrick. More importantly, both Kerrick and Avry don’t immediately succumb to lustful feelings for another and consummate quickly like in a James Bond film. They gradually start to become more intimate, but their relationship really depends on certain events in the story. I love the suspense throughout the novel about whether or not Kerrick really loves Avry in any meaningful way besides feeling both pity and grief about the fact that she’ll be a martyr for the survival of Kerrick’s friend, Prince Ryne. 2) The political situation in the aftermath of the plague within the Fifteen Realms seems more complicated, less of an auxiliary detail. 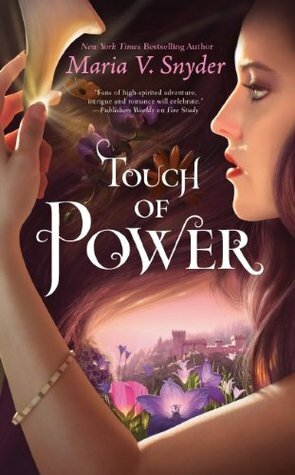 As I write this, I feel like I should re-read the Study books in case I’m being biased towards my much more recent memories of re-reading Touch of Power. Nonetheless, I feel like the political situation within Touch of Power reflects Maria V. Snyder’s growing confidence when it comes to creating the politics of her fantasy world. The politics really reminded me of the power exchange that occurred between the sparring rulers within Robert Jordan’s Wheel of Time series. It helps that the romance between Avry and Kerrick has a political dimension. In a sense Avry as a healer has a different perspective about how to rectify the anarchic state of some of the realms, all due to the pillaging marauders and the survivors that are desperate for any type of ruler being installed in the realm as long as they can bring stability. Since Avry is on the run for so many years and having seen the destruction, she does not see the political situation in the same way as Kerrick. Kerrick seems more adapted to power being obtained through a power struggle of deceit and subterfuge. Kerrick is much more normalized to this view of politics being messy, but more importantly, being a game of sorts that completely overlooks the human face of the situation. Avry does not see a chess game of political intrigue, but rather an infected state that needs healing. Her willingness to understand the different political perspectives,beyond Kerrick’s instilled sense of seeing his political opponents as rivals, though also makes her ironically vulnerable to being used as a pawn in the power struggle between the various rulers vying for rule over the realms. Essentially,Kerrick’s forest magic defines his political stance as one of preserving power, whilst Avry’s healing magic lies outside of political factions and is concentrated on remedying the chaotic situation of the realm. There is so much more to pore over, in terms of the political details of Touch of Power, but I think these paragraphs do the book’s political complexity justice. Coming Soon: I’ll be posting my review of “Scent of Magic,” which was released a few weeks ago. I still have yet to start it because I just finished re-reading Touch of Power. Also, I hope to post an interview with Maria V. Snyder eventually as well. Previous Post A Bibliophile’s Reverie Returns!